Automatic recounts were activated for the US Senate race between Bill Nelson(D) and former Governor Rick Scott(R), and for the Governor race between Andrew Gillum(D) and Ron DeSantis(R). Both races reached the margin of victory of less than 0.5% of total votes that triggered the automatic recount. How did it happen that the Florida results for Governor — a seat held by Republicans for the last 25 years — and also for Senator, were so close that they couldn’t be finalized on election night? And, a #tooradical people’s ideology, a dynamic candidate, and energized group of discounted voters, to create forceful opposition to the Right. At the Little Haiti Cultural Center on election night, folks were invigorated as Amendment 4 passed with an overwhelming 64.53% of the vote. There was hope that it would mean the organizing efforts and messaging extended to motivate voters to Blue in a traditionally Red state. The race had begun with racist remarks by Ron DeSantis encouraging voters not to “monkey this up” after Gillum won the primaries which caught the attention of both party’s base. Gillum presented as a people’s candidate that many organizations endorsed because of his “unity” message, campaigning on the issues of: Medicare For All, raising teacher salaries and funding for schools, supporting restoration of rights, advancing clean energy, and criminal justice reform aimed at reducing the number of incarcerated individuals in Florida. Despite his position on anti-BDS legislation, Gillum seemed like someone who comrades could work with in office. Falling in line with the New Confederacy, DeSantis was less concerned with changing liberal minds than attacking liberal ideologies, making inaccurate associations of his opponent, and getting conservative voters to the polls. On one hand, the door hanger was laughable, while on the other, it spoke to the intentional decision of grassroots organizations and a union to work collectively as Statewide Alliance Group. SWAG specifically consists of: New Florida Majority, Dream Defenders, Organize Florida, Florida Immigrant Coalition, SEIU, Faith in Florida, and Central Florida Jobs with Justice. The Dream Defenders (DD) took a deep dive in community to create an ideology reminiscent of the Black Panther Party Ten Point Program with seven freedoms. DD launched the #freedompapers, claiming #thisistheyear, focusing on building with community to target private prison corporations, like GEO Group, and transform the Florida political landscape. Florida Immigrant Coalition (FLIC) along with Black Alliance for Just Immigration (BAJI) and United We Dream focused on immigrant rights and abolishing ICE. 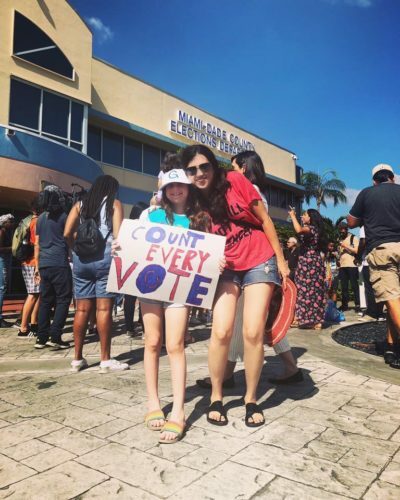 The New Florida Majority (NFM), SEIU, Faith in Florida, Jobs with Justice, and the Movement for Black Lives (M4BL) Electoral Justice Project appealed to their vast membership bases. In addition, the Miami Workers Center (MWC) centered the Movement for Black Women and Girls with Soul Sista’s. Power U Center for Social Change continues to inform youth. Community Justice Project (CJP) supported Poetry for the People’s, Maroon Poetry Festival, which amplified the Black Arts Movement and use of art in activism. 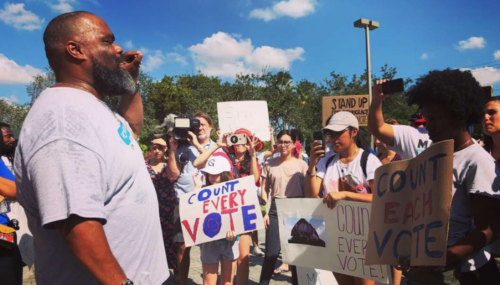 The age old social justice organizations such as NAACP, ACLU, Faith in Florida, PACT, and the likes, also joined the effort to get Amendment 4 passed. All used the same messaging in their conversations which advocated for a Yes Vote on Amendment 4. The strategy was to restore the rights of over 1.4 million voters as freedom voters. It was a brilliant, coordinated strategy in alignment and consistent communication that is beginning to consolidate a united front against the New Confederacy in Florida. 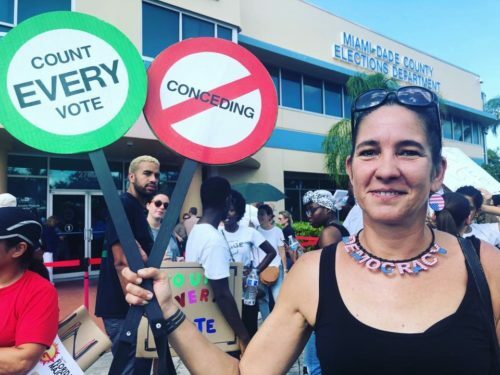 As national attention focused on the gubernatorial races in key Southern states, influencer personalities and thousands of volunteers traveled in droves to Florida to support Amendment 4, and ‘Gillum for Governor.’ The New Confederacy went on the attack with anti-socialist rhetoric as Blue momentum increased. 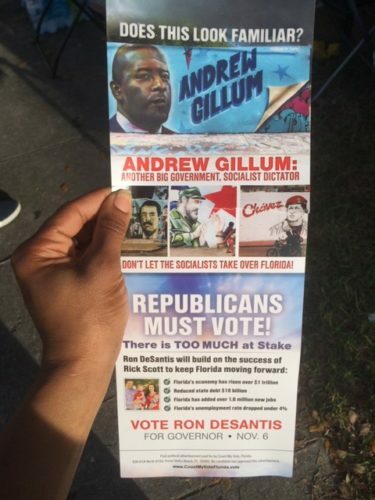 During a debate, DeSantis spent most of his time positioning Gillum as a “too radical” socialist for having signed the Dream Defenders pledge to be a freedom voter. Grassroots efforts made a big enough impact to gain attention as newsworthy, and sent the New Confederacy scrambling on the defensive. The Senate race manifested differently due to Hurricane Michael hitting the Florida Pan Handle. In his role as governor, Rick Scott benefitted from widespread news coverage while Bill Nelson struggled to get any coverage. As the results of the election rolled in confirming the passing of Amendment 4, comrades anticipated that there would be voting consistency across the Senate and Gubernatorial race. That wasn’t the case. By the time Gillum gave his concession speech, which most of us agreed was too early because many of the precincts still had votes to count, folks were exhausted. Wednesday morning reflections in various social media posts were a mix of celebration for Desmond Meade’s leadership in getting Amendment 4 on the ballot and passed, and frustration that the numbers didn’t translate for Gillum. A repeated theme resonated asking white allies to stop hanging out with Black and Brown folks, and start talking to and winning over other white allies. Open and honest discourse is happening across an intersection of communities as a result of this election season. We have the opportunity to continue to build a Florida for All, utilizing best practices from the 4ALL campaigns in Durham and Memphis, the success of the 1Miami Model, and the amplified discourse around the #freedompapers ideology. Organizations working collectively and collaboratively yield a larger share of voice across intersections. Cohesive messaging, that leans general, will have widespread appeal and buy-in. Coordinated support of each organization’s individual focus at various events creates consistency. Controversy activates conversation and creates opportunity to move people. The organizing and strategizing by millennial activists deserves support and resources. Post-election strategies need to be activated immediately to build on momentum. Our outreach conversations should connect generalized concepts of sharing and collectivity that are tangible to the masses to counter anti-socialist rhetoric (e.g. food coops, communal living, ride-sharing, work- space sharing, etc.). Make space for people to tell their stories and relate to others. Motivate the masses with an actionable. Give people something to do like the very successful campaign, #thelovevote, where people with felonies, youth, and others who could not vote, encouraged people in community to vote on their behalf. The passing of Amendment 4 is just the beginning, however big a win. We are up against a conservative demographic and administration in a state where government is limited. The newly restored voters have to be engaged, registered, and informed to vote, in addition to, having any fees resolved. Often, released felons are required to take classes and pay fees; organizers are considering crowd-funding or possible legislation to waive or limit fees. The largest private prison corporation is headquartered in south Florida and the state is incentivized to fill prisons. The Stand Your Ground Law hasn’t been repealed although a group of prosecutors, including the incumbent State Attorney General, agrees it’s unconstitutional. We don’t know how the newly elected AG, Ashley Moody, will serve. FL Amendment 6 passed, giving corporations individual protections. FL Amendment 1 passed, which creates a $600 million deficit in public programs and works so that our disenfranchised communities will suffer even more. FL Amendment 5 passed, requiring a supermajority 2 / 3 vote to make changes in tax laws, and making it more difficult to generate revenues for public schools including Historically Black Colleges and Universities, roads and other necessary services. JoHanna Thompson, MPA is a long-time activist and advocate currently supporting transformation in Florida.